The original Petzl Meteor had a tragically short trajectory—the lightweight wonder was apparently a little too light for its own good. Reports began circulating of helmets being ruined just by being dropped on the ground or being knocked about while dangling from backpacks, and the Meteor was soon gone. 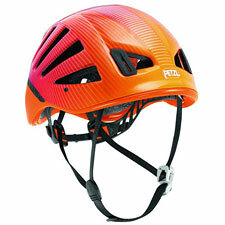 Versions 2 and 3 followed, and Petzl has relaunched the helmet once again as the Meteor III+. Even if Petzl hadn't made any improvements to the helmet's durability, the revised Meteors would still be worth a long hard look thanks to their very light 8.3-ounce weight. Thankfully, however, durability has improved over the various versions. And let's be honest: 8.3 ounces is crazy-light. For those of you who are constantly looking for reasons to leave your helmet at home, weight isn't much of an excuse when you've got a Meteor III+. Petzl claims the Meteor III is the most ventilated climbing helmet available. That plus the helmet's low profile and ephemeral weight make this unquestionably one of the most comfortable helmets you can get, which is probably why it's my most-used climbing helmet. Note that for winter, or foul weather climbing, the extra ventilation can prove less than ideal. Tree Skiers should also be mindful of the added risk of spearing a branch with a vent and getting yanked to a halt by your neck. In either III or III+ version, the Meteor's fit is fully adjustable. The helmet also features four headlamp attachment clips, and it is compatible with Petzl's Vision face shield. As for protection, the Meteor is CD/UIAA certified. Obviously, with a design like this you'll likely want to retire it after any serious hits. I don't see the Meteor III as your best choice if you're looking for a helmet that will last you a lifetime. Pick the Meteor III when weight is the overriding factor—ski mountaineers who do desperate one-day marathon climbs will find this an especially attractive choice. The Meteor will also be appealing to desert and summer climbers who will enjoy the helmet's outstanding ventilation and comfort. As for the durability issues of its predecessor, I haven't heard any similar complaints about the Meteor III or III+. Probably among today's ultralight helmets, the Meteor is the best all-around choice. Recommended.